In tandem with the Malcolm Lowry Under the Volcano conference, artists Alan Dunn, Jeff Young and Martin Heslop have been commissioned to explore Lowry’s relationship with his New Brighton birthplace, working with retired merchant seafarers from Mariners’ Park. For the performance The Lighthouse Invites the Storm Martin Heslop and Jeff Young will be joined onstage by Liverpool’s musical maverick Jack Roberts, multi-instrumentalist Vidar Norheim and singer-songwriter Mersey Wylie. Encompassing live music, film projection, spoken word and songs, this mesmerising new piece weaves together Lowry’s alcoholic visions, the dreams and memories of retired mariners, and the forces of river and ocean to take the audience on a Lowryesque journey into the heart of the storm. There are limited tickets available for the Saturday performance, to book your ticket click here. Looking out over the Mersey itself, Mariners’ Park – home to retired seafarers – plays host to this evening of live music, spoken word, readings and songs in tribute to Malcolm Lowry, drawing on the memories and experiences of the merchant seamen of Mariners’ Park. Performed by Martin Heslop, Jeff Young, Jack Roberts, Vidar Norheim and Helen Tookey. An open afternoon, The Leaving of Liverpool, at Mariners’ Park on Wed 26 Jul, 2.30 – 4pm, Friday 28 Jul, 2.30-4pm, and Saturday 29 Jul, 2.30-4pm, programmed by Roger Cliffe-Thompson with content courtesy of National Museums Liverpool (Merseyside Maritime Museum) – an opportunity to meet retired seafarers and see displays and artefacts. To find out more about these related events please visit The Lighthouse Invites the Storm website. Visit the Bluecoat Lowry event page for more information about the Malcolm Lowry conference: Under the Volcano, 70 Years On. Liverpool City Council announce that the RAY + JULIE site has been sold to a developer. To mark the last few months of RAY + JULIE, we produce a limited edition 7″ single LONDON ROAD 66 81 and arrange to screen Tim’s film of The ballad of RAY + JULIE at Lewisham Arthouse in London. The 7″ single, with photography by Vesta Hex and design by Martyn Rainford, brings together two spoken word RAY + JULIE pieces from Electronic Voice Phenomena and Composers’ Laboratory at METAL. Photography by Vesta, design by Martyn Rainford and additional voice by Emma French, edition of 300, supported by Leeds Beckett University. How to buy and how much it costs is a mystery hidden beneath the tarmac of London Road. Single photographs by Ricky Adam. More information on Ray + Julie in Lewisham here. 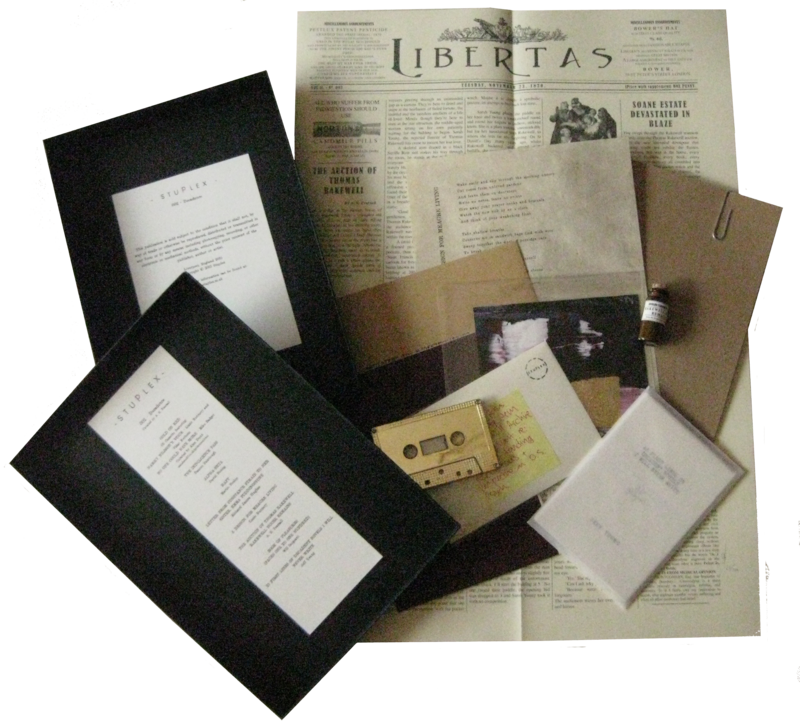 Published by Stuplex, 23 Enigma Vortex Sutra is limited to 230 copies, 115 of which are available with a CD of a live performance recorded at the Liverpool Everyman on 23 October 2014. On November 23rd 1976, Ken Campbell is walking down Mathew Street, a hobgoblin mix of Max Wall and Lear on the Heath, striding amidst a pandemonium of mongrels and fleas, pockets full of chicken bones and piano keys for teeth. Pages torn from the play Illuminatus blowing from his hands, around his skull the mad birds of genius flutter, in a whirl of wild words from other worlds and other lands he staggers and he skips down the Liverpool gutter.